Parker Hannifin has introduced a new Isys Micro valve adaptor to connect the advanced Turck BL67 System; a remote fieldbus communications and electrical I/O device, to increase the functionality and performance of the company’s Isys Micro pneumatic valve platforms. The new Turck BL67 System and Isys Micro valve combination is quick and simple to use, making it easy for OEMs and end users alike to setup and reconfigure a wide range of pneumatically controlled motion and automation systems, while reducing installation times and machine costs. Isys Micro valves are modular in design, enable centralised or decentralised valve islands to be constructed quickly, with back-to-back plug-in connectivity, offer high flow rates and a long operating life in excess of 50 million cycles. To date, the Isys Micro valve platform has been available with the Isysnet and Moduflex fieldbus systems. With the addition of the Turck BL67 System, Isys Micro valves can be supplied as a complete remote I/O system including communication gateways for the most popular industrial and Ethernet protocols and a wide choice of digital and analogue modular inputs and outputs. In essence, the Turck BL67 System is constructed from three sets of components: programmable or not programmable communication gateways that act as the connection to the industrial network; Digital and analogue I/O modules to connect discrete field devices or RFID modules; and valve driver modules to control up to 16 or 32 solenoid valves on an Isys Micro valve manifold. The TURCK BL67 system offers connection to DeviceNet, CANopen, Profibus DP, Profinet IO, Ethernet/IP and Modbus/TCP, and is supplied with free PACTware software, which provides ease of configuration, either on- or off-line, and comprehensive valve interrogation and channel level alarms and diagnostic functionality. Other features include short circuit detection with electronic feedback, parameter-level explicit messaging, and the option of horizontal or vertical mounting without the need for re-rating. 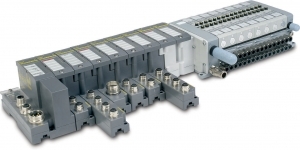 In addition, the Turck BL67 System is designed to meet the demands of a wide range of industrial applications, offering a robust and reliable valve control solution, with optical isolation between field and system circuits, built-in panel grounding, and a robust backplane, capable of withstanding 5g vibration forces. Depending on the customer choice, the Isys Micro valve with Turck BL67 System can either be supplied by the Parker sales network as a complete device, or separately with Isys Micro Valve and BL67 System through respective Parker and Turck sales channels.